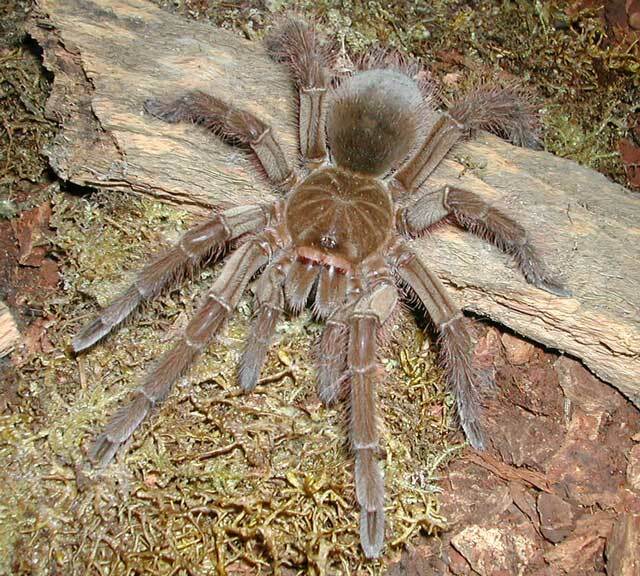 Today I want to write about a very big, scary spider, the goliath birdeater. These huge, scary spiders have a body that grows up to 12 cm long and a leg span of up to 28 cm. They are the heaviest spider in the world and have one of the longest leg spans. Despite their name, they don’t usually eat birds, but mostly eat insects, worms and other spiders. They can also catch and eat lizards, frogs and small mammals. Goliath birdeaters live in burrows during the day and come out at night to hunt. They have very poor eyesight and mostly detect their prey through vibrations in the ground. They then pounce on their prey and inject venom through their fangs. Despite their impressive size and large fangs, like other tarantulas, their most common form of defense is to rub their back legs against their tummy which flicks tiny, sharp hairs into the air. These hairs are very irritating to the eyes, nose and back of the mouth. Goliath birdeaters live in swampy parts of the rainforests in the South American countries of Venezuela, Guyana, Suriname, French Guiana and Brazil. They are often collected for the pet trade, but are not considered endangered. Are there any other interesting facts that you would like to share about goliath birdeaters?